Some of you may remember little sweet Charlotte (my daughter's niece) who was born very early on Christmas morning. I'm really no relation to her, but I tend to think of myself as a great-aunt. I get to keep her on Monday afternoons while her mom goes to work. She's a very sweet baby and I really enjoy getting to see her. Something we always do is read - Dr. Suess, Mother Goose, Golden Books... I read to Lauren from the very first day we brought her home and I see reading as bonding and learning. 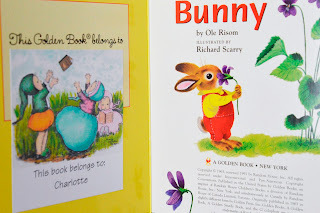 My first gift to Charlotte (even before she was born) was books! 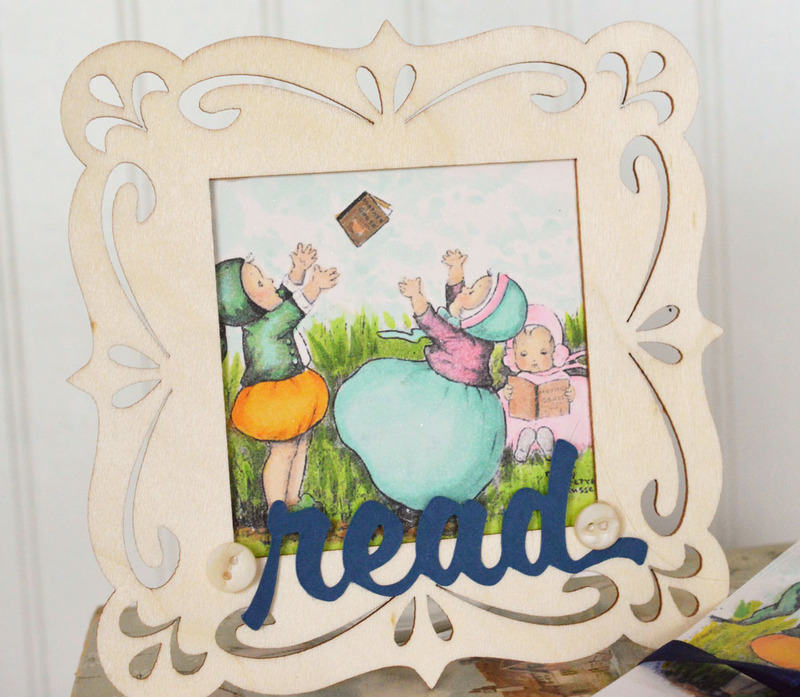 When I first saw this image from a Mother Goose collection at Nicecrane Designs, I thought "that would make a darling bookplate!" This collection is available in its original form (already colored) as well. I colored one up and then thought "oh, no! I don't want to color a zillion more!" Even though it was fun to color. You've probably already figured out the solution, but I had to think about it for awhile. 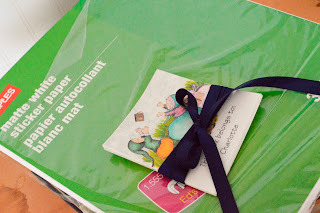 Scanner+Computer+Sticker Paper = Easy Bookplates! I scanned in my colored image and reproduced it to get six on a page, added the text, and printed it out on sticker paper. Cut apart the bookplates and wow, that was really easy! I framed the original and Charlotte has a nifty little decoration for her bookshelf! 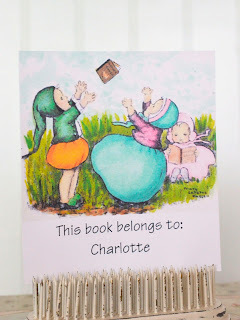 Here's one of the bookplates in action - making sure everyone knows this book belongs to Charlotte! And here's some good news: Nicecrane Designs is offering 25% off today and tomorrow for National Scrapbooking Day! 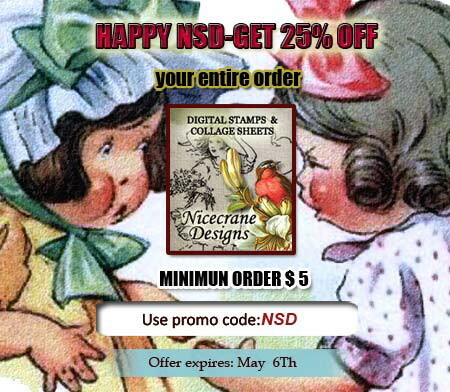 Just use the code NSD for your discount at checkout. I'll link this up at Make It Monday. So glad you stopped by! Have a wonderful week! 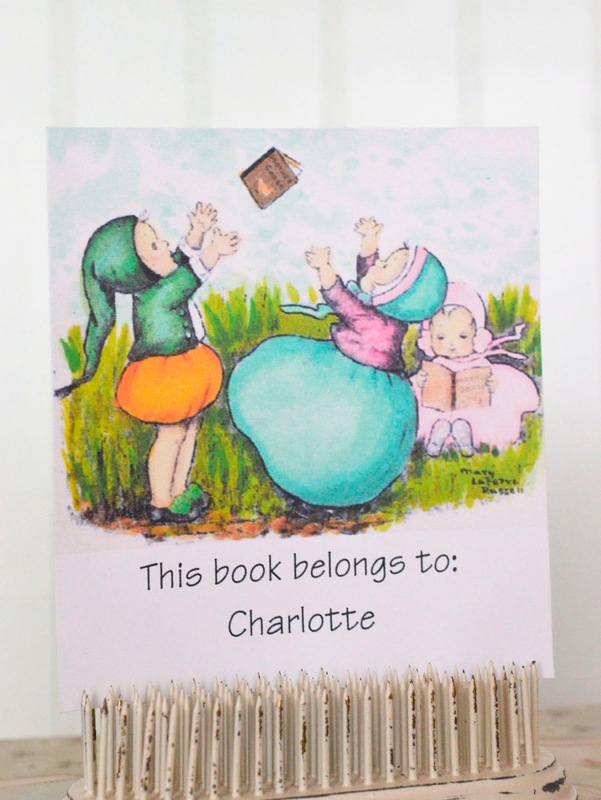 How very sweet of you to make such a wonderful bookplate for little Charlotte Lori. She will probably (and hopefully!) become an avid reader with the help of your fab bookplate! Hello my friend. I bet its fun watching that little one.. I love your bookplate. Your coloring looks fabulous..
Hi Lori, I hope you do! & drop back by soon I’ll be sharing a recipe with using the same yogurt! Can I just say yummy & goes with coffee or tea. 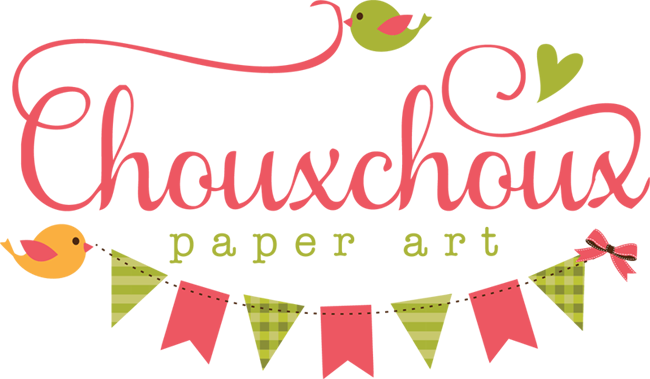 & come link up your lovely bookplate or other post on my link party. You'll find it on Friday's posts new each week. I'd love ot have you join in. 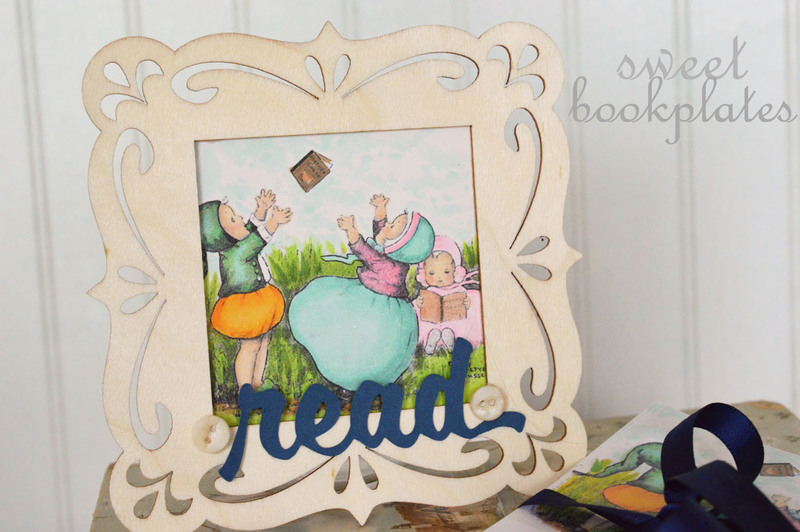 Your bookplate is darling. It's so cute! I'm visiting from MIM. 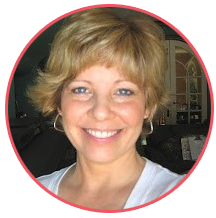 Fantastic Lori! Great idea and you made those bookplates so beautiful! 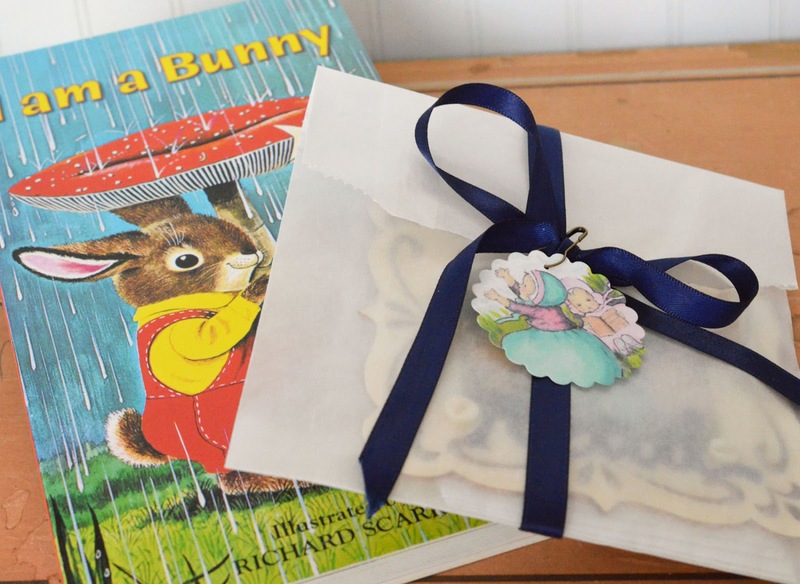 Thank you so much for sharing with us at Make it Monday! so very, very sweet! Only wish I could have seen the book it sounds delightful. You just sold me sugar - went and bought the set. I love bare fannies!!! !